Urška started her musical journey when she was five years old and began with recorder lessons in Cerknica in Slovenia. She continued her lessons with prof. Jasenka Jelačić in Ljubljana and then entered a series of national competitions. Her first success brought her to the LMFL (Dolmetsch) courses where she first met Prof. David Bellugi (September 1954 – 7 June 2017) who was to occupy a very important place in her musical life. In 2003, at only thirteen years old, she passed the Graz University entrance exam as a special young talent, and studied recorder in Austria for three years with prof. Robert Unger and Dr. Yvonne Luisi-Weichsel. In 2006 she started studying at the Conservatory for Music and Ballet in Ljubljana with Mateja Bajt, and in 2010 she continued at the Academy of Music in Ljubljana with the same professor. She graduated with a BA in 2013 and moved to Florence, Italy, where she enrolled in the Masters Programme at the “Conservatorio di Firenze Luigi Cherubini”. She spent the following years studying with prof. David Bellugi, teaching and performing around Italy, mostly with the Chicas del David trio. She graduated with honors (MA degree). It is impossible to describe Urška in one word. She loves to explore many different styles of music with diverse groups. Playing with Chicas del David is relatively new, performing all over Tuscany and playing everything from medieval music to jazz. The recorder trio has already been successful in international competitions. 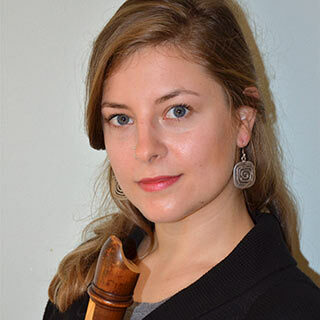 Urška has been teaching recorder first in a private music school ProArte in Ljubljana, then in the national music school Kranj and in the “Conservatorio Luigi Cherubini” (Florence) as Prof. Bellugi’s assistant and as part of her studies. Since obtaining her MA, she has been studying pedagogy for a PAI certificate and teaching at the British International Music School and at the Waldorf (Rudolf Steiner) School in Ljubljana.